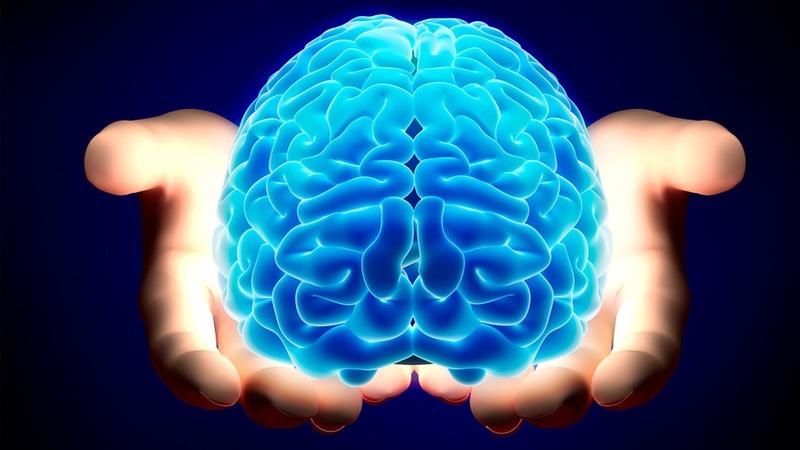 The human brain is unquestionably the most complex organ in the body. It is made up of approximately 100 billion cells, responsible for literally tens of millions of tasks, taking place at unimaginable speeds simultaneously – all in order to sustain the gift of life. Neuroscience and cognitive neuroscience, are rapidly helping us to make sense of the independent functions within the brain and the amazing culture of interdependence at this level that makes human life possible. It’s not a necessity to understand the brain with all of its complexity, however, to have a sense of its capacity, skills and magnitude, does offer us a sense of our own magnificence. Also having an appreciation of its breadth and depth breeds humility and respect for nature’s wonder…. When you look at a human brain from the top or sides, almost everything you see is the neocortex. It’s called ‘neo’ (new) because it was the last part of the brain to evolve. The cerebral cortex and the neocortex are in fact the same thing – the crinkley surface that you see in pictures of the brain – which consists of six layers. The cerebral cortex is about two millimetres thick and has a total surface area of about one and a half square metres, which covers the whole brain, except for a bit of the cerebellum that sticks out from the back. The cerebral cortex has two hemispheres. The left hemisphere receives most inputs from, and controls mostly the right side of the body. This hemisphere specializes in language, logic, rule-based reasoning, analytic skills and processes events using the past and the future as critical points of reference. The right hemisphere deals primarily with the left side of the body, and it is better at visual pattern recognition, abstract and creative thought, emotion and it’s primary ‘time reference’ is the present moment. It is also better at more holistic kinds of analysis and perception. The two hemispheres are connected by the corpus callosum, which contains approximately two hundred and fifty million axonal fibres. The hemispheres work collaboratively, with countless tasks being executed moment by moment, although in most people one side is more dominant. For example, right handed people tend to have a dominant left cerebral hemisphere. However, it should be noted that other factors also influence cerebral dominance, such as: upbringing, education, socialisation, nutrition and lifestyle etc. In essence, the left hemisphere processes the details, and the right hemisphere looks at the bigger picture. So we’ve established that the cerebral cortex is associated with ‘higher’ functions: consciousness, language understanding, cognition, abstraction, problem solving, motor and sensory integration etc. Things like love and empathy are more associated with the limbic regions, which are considered the ’emotional centre’ of the brain (also housed in the forebrain). The midbrain, also called the mesencephalon, is a small region of the brain that serves as a relay centre for visual, auditory, and motor system information. It is the front part of the brainstem, and any disruption to this area can cause irreversible damage and impairment. Illnesses most commonly associated with this region of the brain are stroke, schizophrenia and Parkinson’s disease. This region of the brain is also responsible for digestion, heart rate, breathing rate, vision, hearing, temperature control, motor control and alertness. The midbrain connects the brain stem to the thalamus, allowing for information to be relayed from the senses to the brain and back to the muscles. This is the region of the brain that connects the cerebrum with the spinal cord. It contains vital structures including the medulla oblongata which controls breathing, heart rate, swallowing, blood pressure and digestion. And the cerebellum, which co-ordinates sensory input and maintains muscle movement and balance. Motor and sensory neurons travel through the brainstem allowing for the relay of signals between the brain and the spinal cord. The brainstem co-ordinates motor control signals sent from the brain to the body. The brainstem in addition to controlling life supporting autonomic functions, also is responsible for the peripheral nervous system. The neocortex interacts with the rest of the brain primarily through a structure called the thalamus. The thalamus, which is underneath the neocortex, functions like a command centre that controls what information goes between different parts of the neocortex and the rest of the brain. Virtually all signals from the senses are relayed through the thalamus, as are the signals from other subcortical areas. Many areas of the neocortex also communicate with each other through the thalamus, such is its primacy and signifigance. While the neocortex can do very finely tuned analysis of the ‘things’ we are ‘looking at’ or examining, the thalamus controls ‘where’ we look. So if the neocortex is damaged, one may lose particular attributes or skills. However, if the thalamus is damaged sufficiently, one loses consciousness and therefore control. The hypothalamus – The hypothalamus regulates emergency responses such as the ‘fight or flight’ response, as well as non-emergency vital processes such as feeding and reproduction. The hypothalamus also controls the release of hormones and neurons affecting heart rate and respiration. This part of the limbic system controls homeostatic body functions such as temperature and circadian (various biological) rhythms. It is often referred to as the ‘mood centre’, given the affect the mood has on all of these vital functions. It is clear that our emotions significantly impact and alter our biochemical composition and characteristics. The amygdala – This part of the limbic system regulates behaviour and is primarily involved with emotional processing. The amygdala interacts with the prefrontal cortex to generate and process the major emotions of anger, happiness, disgust, surprise, sadness, and, particularly, fear. People who have sustained damage to their amygdalas have reduced abilities to react to and avoid situations that induce fear. The hippocampus – This area is responsible for the formation, storing and organizing of memories. The hippocampus has a crucial function in the creation of memory and receives inputs from virtually the entire neocortex. Through specialized adjustable synaptic receptors called NMDA receptors, it can link together virtually any constellation of data/information that defines an object and its context. It’s this contextual ability that makes the relationship between the amygdala and hippocampus crucial, because when there is a disconnect between these two, for any reason, emotions become difficult to assess and manage. Orbitofrontal cortex – The orbitofrontal cortex is where the amygdala and other structures of the limbic system interact with the prefrontal cortex, enabling the information to be used to best ‘protect’ the system. For example, imagine picking your child up from school on Wednesday afternoon and just as you’re about to pull off and build up speed, another car appears from nowhere forcing you to have to brake quite hard and shaking you and the child up in the process. It is very likely for weeks or months after that, particularly on Wednesday afternoons, that you will have a little twinge of uneasiness or even fear as you pull off from the school, as the event is unconsciously ‘relived’, to ensure the necessary caution. Your orbitofrontal cortex has stored the circumstances and events, and the amygdala has stored the fear. Hopefully, you can see how in an effort to protect from future harm, the foundations of anxiety can quite easily be laid, especially if the right checks and balances are not put in place. The anterior cingulate cortex – The anterior cingulate cortex seems to primarily ‘monitor’ the progress towards whatever goals we are pursuing. It generates an “oh no” signal when things aren’t working out, indicating a change in strategy may be needed. 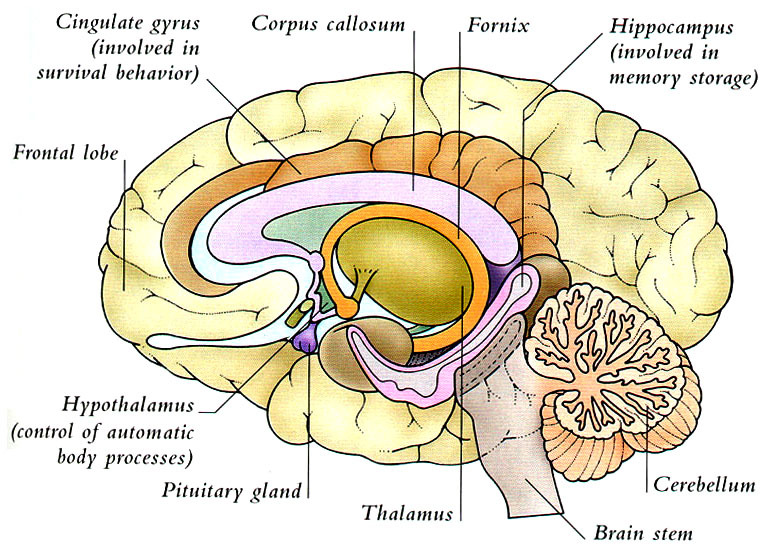 The basal ganglia – The basal ganglia consists of five major nuclei: the caudate, putamen, globus palladus, substantia nigra, and subthalamic nucleus. These nuclei comprise a highly interconnected system that interacts with the thalamus and neocortex to primarily control behaviour. The midbrain and the limbic system also form part of the reticular activating system (RAS). It is this area that regulates wakefulness and sleep. Motor neurons: Motor neurons contract muscles and mediate behaviour. There are other output neurons, which stimulate glands and organs. Computation neurons: The vast majority of neurons in vertebrates are computation neurons. Computation neurons extract and process information coming in from the senses, compare that information to what’s in the memory, and use the information to plan and execute behaviour. Each of the several hundred brain regions contain very approximately several dozen distinct types of computational neurons that mediate the function of that area of the brain. There are obvious structural differences between neurons and most other cells. While most non-neuronal cells resemble squashed spheroids, neurons typically have a ‘dendritic tree’ of branches (processes) arising from the cell body (or soma), plus a single process called an axon that also emanates from the cell body but runs for large distances (sometimes even up to several feet) before it branches. While the dendrites receive inputs from other cells, the axon sends the output of the cell to other cells. Many axons are sheathed by glial cell processes that provide extra insulation. These are called myelinated axons. The gaps between the myelin wrappings are called nodes of Ranvier. This is where the electrical pulses ‘repeat’, thus enabling the signal to maintain its strength over long distances. Myelinated axons have fast conduction velocities in which the ‘action potentials’ travel at several hundred metres per second. Many smaller axons in the nervous system are unmyelinated and conduct action potentials more slowly. What really distinguishes the nervous system from any other functioning group is the complexity of the neuronal interconnections. The human brain has approximately 100 billion neurons, each with a unique set of about 10,000 inputs, yielding about a quadrillion synapses — 1,000,000,000,000,000,000,000,000!! The number of possible permutations that this system is capable of producing is virtually uncountable. Anther example of the unlimited capacity housed within our humanity. We really are miraculous! The debate continues as to whether consciousness is ingrained into the fabric of the brain, or whether it is a metaphysical entity separate and distinct from the physical nature of the brain and its organs. This is a decision we each have to make for ourselves, but we believe the data indicating that consciousness exists as a separate force, which is intimately entwined with the powerhouse that is the brain, is substantial. The developments in neurotheology and the noetic sciences are leading this charge. The brain is to be marvelled at but the force housed within the brain (the life force – the soul/spirit) should be marvelled at no less. That force, when it becomes aware of itself and relates to matter and its environment in a virtuous and ethical way, can perform wonders. When we make the mistake of believing we are these bodies, which includes the brain, we lose touch with the unlimitedness of ‘I’. Descartes was right when he spoke about the ‘ghost in the machine’ – something we seem to have lost sight of due to the rise of materialism. Mindfulness, meditation, contemplation, still time and prayer all offer us a doorway into the world of experience and it is in that world that the metaphysical discoveries are made, way beyond logic and the senses.